Systemic Enzyme Formula with Serrapeptase – Nattokinase – Bromelain & More! is shipped direct from the manufacturer to the customer USPS Priority Mail. Trevinol Professional consists of a clinically developed Proprietary Blend of systemic enzymes that includes Serrapeptase, Nattokinase, Bromelain, proteolytic enzymes and proven antioxidants. Trevinol Professional was scientifically formulated for fibrin defense to protect from damage caused by excess fibrin buildup and the resulting inflammation. As we mature and the overall production of metabolic enzymes in the body decreases, the result can be serious health concerns. The ingredients in Trevinol Professional have been studied for over two decades and are recommended by healthcare professionals worldwide. The Trevinol Proprietary Blend is the most advanced systemic enzyme therapy currently available. Scientifically developed, this exclusive formulation may be more potent than other leading systemic enzyme blends and is 100% vegetarian. Trevinol was formulated to replenish the enzymes and important antioxidants that are depleted from the body as we age. This unique formula provides a complete range of "proteolytic" (protein digesting) enzymes coupled with our Enzyme Catalyst Blend of anti-oxidants to prevent the formation of fibrin. Fibrin is elastic, insoluble, mesh-like looking protein produced by the action of blood clotting and impacts a wide variety of health conditions. Fibrin plays a key role in the healing process in which molecules of fibrin form a network trapping cells and debris that seal off a damaged vessel. Unwanted fibrin formation however, can occur inside healthy blood vessels and tissue, causing thromboses. Researchers now believe that excess fibrin accumulation is a major cause of inflammation, arthritic swelling, scar tissue build-up and related cardiovascular disorders. The Hydrolase CoFactors Blend developed by Landis Revin for Trevinol works in reducing inflammation, enhancing circulation and improving joint health and mobility. The result is reduced pain and arthritic symptoms. Trevinol provides a synergistic blend of fibrin-reducing enzymes is designed to remove fibrin buildup and promote greater well-being. Proteolytic enzymes such as Serrapeptase and Nattokinase, those found in Trevinol, are recognized to potentially and substantially lower C-Reactive protein levels (CRP), an inflammation marker linked to cardiovascular disease. C-Reactive Protein is produced by the liver and has been linked acute arterial inflammation. Triggered by the immune system, inflammation helps the body attack disease-causing germs, repair injured tissue and promote healing. When the fight is over however, the actions of the immune system often leave residual damage. Recent studies indicate that inflammation is the driving force behind atherosclerosis, in which plaque accumulates within the walls of the arteries, reducing blood flow and increasing the risk of stroke. According to a Harvard School of Public Health study, high levels of C-Reactive Protein in the blood were associated with a 79% higher risk of heart disease in men and women over a period of 8 years. Many professionals now feel that high CRP levels may even be a better predictor of heart attacks than cholesterol levels. According to researchers directing the Framingham Heart Study, a study of over 7,900 men and women supported by the National Heart, Lung, and Blood Institute, and published in The Journal of Circulation, (February, 2006) the results confirmed that aggressively treating cardiovascular disease risk factors can significantly reduce the risk of cardiovascular disease and add 10 years to your life. The results were based on findings from the study of 3,564 men and 4,362 women. 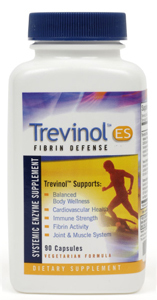 Trevinol Professional was developed to promote enhanced circulation, improved blood flow and lower blood pressure. This may be accomplished by the reduction of excess fibrin and unwanted debris within the cardiovascular system, while preventing gastrointestinal stress, or damaging the liver. For people currently experiencing some form of heart disease, Proteolytic enzymes have shown promising science in the ability to dissolve arterial plaque, diminish scar tissue, and reduce LDL cholesterol. Nattokinase has been clinically shown to remove arterial blockages over 50% faster than the body's own natural Proteolytic enzymes. The combination of Serrapeptase, Nattokinase and the Enzyme Catalyst Blend found in Trevinol offers a complete fibrinolytic compliment of enzymes. Compare our proprietary formula to other products. Many of us are familiar with the digestive enzymes found in the stomach and intestines; they process the various foods we eat. However, other types of enzymes are reaction-causing agents which make breathing, growth, healing and other body functions possible. Enzymes more than just sustain life, they are catalysts for virtually every biological and chemical reaction in the body. Without enzymes, life itself could not exist. As we age however, our own enzyme production significantly diminishes. The enzymes we need to maintain healthy joints, a strong immune system, good circulation and overall balanced well-being are less available. Trevinol Professional™ contains 100% vegetable derived enzymes which are readily bioavailable and therefore, chemically more effective than our bodies own natural enzymes. These enzymes attack fibrin and may reduce the impact of fibrin buildup associated with arthritic and inflammatory conditions, plaque build up within the arteries, scar tissue, production of C-Reactive Protein (CRP) and Fibrosis. Unlike the digestive enzymes found in the stomach and intestines which are responsible for processing food. Systemic Enzymes are reaction-causing agents allowing cells to regenerate, enable breathing, healing and make other body functions possible. Trevinol Professional™ contains plant-derived enzymes, which pass easily through the stomach and digestive tract and are rapidly absorbed into the bloodstream. These enzymes work "systemically" or throughout the entire body. Trevinol employs a clinically proven delivery system that ensures that these enzymes are distributed within your body and organs while in their most active state. Proteolytic enzymes (meaning "protein-dissolving") often in the form of Serrapeptase are ubiquitous in nature. They are found in animals, plants, bacteria, and fungi. Human beings produce enzymes to help digest our food, but we also produce numerous other types, which act to control virtually every regulatory mechanism in our bodies. These complex enzymes breakdown and digest proteins into fragments. Recent scientific evidence supports the use of proteolytic enzyme supplements for enhancing digestive function and for speeding recovery from injury/surgery and reducing swelling and inflammation. Proteolytic enzymes are the primary tools the body uses to "digest" organic debris in the circulatory and lymph systems. This process of cleansing the blood of debris can significantly improve blood pressure, circulation and reduce cardio risk factors. Excess fibrin in the blood can result in blockages and the risk of clots. Certain specialized proteases such as nattokinase are extremely effective at improving the "quality" of blood cells, optimizing the ability of blood to flow through the circulatory system, and reducing the risk of clots. This is extremely important in reducing the risk of stroke. Many patients now use proteolytic enzymes during long plane flights to minimize the potential of blood clots in the legs. Scar tissue is made of protein. Proteolytic enzymes have the unique ability to effectively "digest" dead cellular matter and scar tissue, while leaving active, living cells intact. This is particularly true in the circulatory system. Dietary Supplement: Three(3) Capsules, daily with 8oz of water. Loading Phase: During the initial Three (3) weeks of usage, take Six (6) Capsules daily. You may continue at this dosage level if you are treating severe inflammation or a chronic disorder. Important Note: Take at least 90 Minutes before or after a meal, "away from food", or as your physician recommends." Serraspore Blend™: Encapsulated Lactobacillus sporogenes (585 million CFU), Vegetable cellulose. Enzyme Catalyst Blend: Quercetin, USP Coenzyme Q-10, Alpha-Lipoic Acid, and Magnesium. The medical use of enzymes as anti-inflammatory agents goes back many years. In the early 1950s it was discovered that certain enzymes could relieve the symptoms of many different inflammatory conditions, including rheumatoid arthritis, ulcerative colitis, and atypical viral pneumonia. Subsequently the use of special enzymes were found to be beneficial in counteracting post-surgical swelling (edema), treating thrombophlebitis and lower back strain, and rapidly healing bruises caused by sports injuries. Today, there is mounting evidence of the value of Proteolytic enzymes in reducing inflammation which can lead to circulatory problems, coronary heart disease and stroke. Recently, American Heart Association and the Centers for Disease Control and Prevention published a joint scientific statement supporting the use of inflammatory markers in clinical and public health practice. Most studies show that the higher the C-Reactive Protein levels, (known as "CRP”), the higher the risk of developing heart attack. Recent scientific studies have found that the risk for heart attack in people in the upper third of CRP levels is twice that of those whose CRP is in the lower third. Maintaining a strong and efficient cardiovascular system is central to living a long and productive life. According to the Heart Lung Vascular Institute at the University of Tennessee, Heart Disease is the leading cause of death in men and women in the United States, and it's not just a result of aging. Certain lifestyle habits and genetic factors lead to the heart and the body's network of blood vessels to become overworked and damaged, often due to inflammation. As we age, our body’s produce less enzymes which may lead to serious health conditions, including the buildup of fibrin in our joints, veins and throughout our system. Trevinol ES was developed to reduce fibrin levels, promote enhanced circulation, restore joint health and mobility, boost immune strength and reduce inflammation and scar tissue. Recent studies have shown the correlation between elevated vascular inflammation, LDL (bad) Cholesterol and increased risk of heart disease. Trevinol Professional contains key nutrients formulated to reduces levels of vascular inflammation, arterial plaque and bad cholesterol. We believe that with regular professional healthcare, a healthy diet, low in cholesterol and saturated fats, proper exercise and an enzyme supplement, such as Trevinol Professional, you can help maintain your normal enzyme levels and live a healthier lifestyle. The Hydrolase™ Enzyme CoFactors Blend developed by Landis Revin for Trevinol Professional works to aide in circulation, joint health, mobility, healthy aging, the reduction of inflammation, sports injury recuperation and much more. The word “arthritis” is derived from arthron, the Greek term for joint, and the suffix itis, meaning disease or inflammation. In fact, arthritis, comprising more than 100 diseases and conditions affecting joints and connective tissues, is a cause of pain, inflammation and loss of mobility. More than 46 million Americans have arthritis related conditions, and another 23 million suffer from chronic joint problems. Serrapeptase, also known as Serratiapeptidase, is a vegetarian enzyme that naturally eases pain, swelling and inflammation from overexertion, injury and everyday activities. Classified as a proteolytic enzyme it is isolated from the non-pathogenic enterobacteria Serratia E15. Serrapeptase works to break down extraneous fibrin, mucus and other compounds that congregate when the body’s natural repair functions are working. It promotes cardiovascular and arterial health, joint and muscle repair and supports the body's natural process for drainage and healing. In simple terms, Serrapeptase digests dead tissue, blood clots, cysts, and arterial plaque. This Proteolytic or "Protein digesting" enzyme is one of the many potent proteolytic enzymes available today that exhibits an unusually high fibrinolytic activity and is generally well tolerated. Serrapeptase is a powerful inflammation normalizer that acts as a potent force to reduce systemic fibrin concentrations within the body. When it's combined with the other key ingredients in Trevinol, the results can be significant. This enzyme, like the other enzymes used in Trevinol, breaks down "non living" matter in the human body. This action may promote a reduction in levels of dead tissue, and may also promote normal mucous levels both in the sinus and lung. Serrapeptase is a super protein-digesting enzyme, which has many implications as to its high level of performance. Nattokinase is a systemic (works through the whole body) enzyme that is created when boiled soybeans are fermented with the probiotic bacteria Bacillus subtilis natto to create the traditional Japanese soy food called natto. Nattokinase supports the fibrinolytic clearing system in the body which is responsible for healthy circulation, by helping to break down fibrin protein deposits in the bloodstream to promote and enhance healthy blood flow. What Causes Most Heart Attacks and Strokes? Many of us develop plaque: a buildup of cholesterol and other materials in the walls of our arteries. Over time this plaque can restrict the flow of oxygen-rich blood throughout the body. In addition, high blood pressure can place stress on the plaque as blood flows past it. Plaque may eventually rupture, causing platelets to stick together and form a clot—which can limit or completely stop the flow of blood to part of the heart or brain. This often results in a heart attack, heart-related chest pain, or stroke. So although high cholesterol and high blood pressure play a role in the process, clot formation can often be the direct cause of a heart attack or stroke. That's why it's important to reduce the risk of clot formation. Dr. Martin Milner of the Center for Natural Medicine in Portland, Oregon and Dr. Kouhei Makise of the Imadeqawa Makise Clinica in Kyoto, Japan were able to launch a joint research project on nattokinase and write an extensive paper on their findings. "In all my years of research as a professor of cardiovascular and pulmonary medicine, natto and nattokinase represents the most exciting new development in the prevention and treatment of cardiovascular related diseases,"
Dr. Milner said. "We have finally found a potent natural agent that can thin and dissolve clots effectively, with relative safety and without side effects." The amount of CRP produced by the body varies from person to person, and is affected by lifestyle as well as genetic makeup. Higher CRP levels can significantly increase inflammation throughout the body. People who smoke and those living sedentary lifestyles, or who are overweight or have high blood pressure are most at risk. Research shows that too much inflammation can have adverse effects on the blood vessels which transport oxygen and nutrients throughout our bodies. Atherosclerosis, which involves the formation of fatty deposits or plaques in the inner walls of the arteries, is now considered in many ways an inflammatory disorder of the blood vessels, similar to how arthritis is an inflammatory disorder of the bones and joints. Inflammation not only affects the atherosclerotic phase of heart disease, but also the rupturing of plaques which can then travel and interfere with blood flow, causing a heart attack. Reducing levels of C-Reactive Protein can have a beneficial effect on cardiovascular health and joint and bone wellness. Protease (also known as "proteinases" or "peptidases") are enzymes that are essential for all life. They play pivotal regulatory roles in conception, digestion, growth, maturation and aging of all organisms. Proteases regulate most physiological processes by controlling the activation, synthesis and turnover of proteins. This unique enzyme acts as a sharp knife, cutting long sequences of amino acids (called peptides) into fragments that fold into proteins. Amino acids are common building blocks for all life. Organisms (including humans and other mammals) extract them from their environment (diet) or synthesize them, and link them together to form biological polymers (called polypeptides). Proteases are essential for the synthesis of all proteins, controlling protein composition, size, shape, turnover and eventual depletion. Designed to enhance the effectiveness of our systemic enzyme blend, Serraspore™ Lactobacillus is a preparation containing viable spores of L. sporogenes. Lactobacillus take up residence primarily in the wall of the small intestine, where they provide many functions, including normalization of pH, promotion of digestive function, and stimulation of immune response and antimicrobial activity. They can help prevent vaginal yeast infections, and support healthy cholesterol levels. L. sporogenes is a particularly hardy member of the lactobacillus group. It is stably encapsulated in spores that can resist stomach acid, antibiotics and other chemicals, heat, radiation, and freezing. Lactobacilli have been shown to be effective in the treatment of a variety of disorders, including gastrointestinal disorders, certain infections, hepatic encephalopathy, hypercholesterolemia and conditions related to deficiency of vitamins B. Lactobacilli have proved to be useful in delaying the induction of tumors and have found use in the prevention of colon cancer. Lactobacilli are thus valuable therapeutically and are often used as adjuvants to antibiotic therapy. Scientists N.W. Nowotelnow and L.M. Horowitz-Wlassowa first isolated L. sporogenes in 1933 and gave it its name. This was changed to Bacillus coagulans in the 5th edition of Bergey's Manual of Determinative Bacteriology but was eventually given its original name back to honor its discoverers. Lactobacilli improve the digestibility of ingested food constituents and the bioavailability of nutrients, including the enzymes found in Trevinol Professional. Antioxidants provide your body a defense at the cellular level by stabilizing or deactivating free radicals before they attack and damage our cells. This vitamin-like antioxidant, sometimes referred to as the "universal antioxidant," is readily absorbed by the body as a supplement. ALA exists as both fat and water soluble, which enables it to function in many different tissues providing you with protection against the oxidative damage of free radicals. ALA may also promote healthy blood flow to nerves, which may promote normal transmission of nerve impulses. It is also capable of binding and helping to eliminate heavy metals, repairing damaged molecules and may also promote healthy liver function. ALA also has the unique ability to directly recycle, re-activate, and extend the lifespan of other antioxidants such as vitamin C, and Vitamin E, creating an antioxidant framework that is highly effective. This unique vitamin-like substance is fat-soluble and is present in every cell of the body. It serves as a coenzyme for several of the key enzymatic steps in the production of energy within the cell. Clinical research suggests that CoQ-10 decreases the proliferation of free radicals, which supports a healthy immune system. It also stimulates your metabolism to aid the body in the conversion of food to energy and is essential to the production of ATP, cell respiration, electron transfer and the reduction of cellular oxidation. Recently published in the February 2006 edition of the Journal of the American Academy of Dermatology, and earlier in the January edition of the prestigious journal Neurology, new research studies have confirmed the benefits CoQ10. As research continues, there is growing clinical evidence that Coenzyme Q-10 (CoQ10) seems to have amazing capability for promoting healthy immune function, cellular and muscle health. It's also effective for slowing the progression of a devastating loss of brains cells (neurologic disease) that control movement as we age. And, a study that was published in the Archives of Neurology a couple of years ago indicating that CoQ10 was actually able to slow the progression of Parkinson's disease. In addition, CoQ-10 helps maintain normal cardiovascular function and is essential for enzymes to function in the body. Quercetin has demonstrated significant anti-inflammatory activity because of direct inhibition of several initial processes of inflammation. For example, it inhibits both the manufacture and release of histamine and other allergic and inflammatory mediators. As an antioxidant, it protects LDL cholesterol ("bad" cholesterol) from becoming damaged. A variety of evidence indicates that quercetin possesses potent antioxidant properties. Cardiologists believe that damage to LDL cholesterol is an underlying cause of heart disease. Quercetin blocks an enzyme that leads to accumulation of sorbitol, which has been linked to nerve, eye, and kidney damage in those with diabetes. Quercetin functions like other bioflavonoids in enhancing the collagen network (structural integrity) of blood vessels, and is known for its antiviral activity. It also is considered a phytoestrogen (i.e., a plant substance with similar functions as that of estrogen). Some phytoestrogens are believed also to have antiestrogenic effects that might lead to reduced risks of certain illnesses. Enzymes are basic proteins that act as catalysts to regulate the speed at which biochemical reactions occur in our body. They affect the rate, but do not alter the direction or nature of the reactions. You may have be familiar with a term know as "Enteric Coating". This is a barrier applied to the outside of a tablet containing certain enzymes. The purpose is to control the location in the digestive system where these enzymes are absorbed. Enzymes derived from animals, such as Pancreatin and Chymotrypsin may need to be enterically coated because their effectiveness will be reduced by stomach acids or other enzymes if left unprotected. They begin breaking down in the intestines. Such is the case with animal derived enzymes. THE ENZYMES FOUND IN TREVINOL PROFESSIONAL ARE PLANT-BASED AND NATURALLY OCCURRING. THEY ARE NOT DERIVED FROM ANIMALS AND DO NOT NEED ENTERIC COATING. The pharmaceutical grade enzymes developed for Trevinol Professional are encapsulated in a vegetarian gel capsule and avoid the heating process used in most compressed tablets. This process can degrade or damage the effectiveness of certain enzymes. Trevinol does not contain any fillers or bonding agents commonly found in compressed tablets. Our research demonstrates that capsules containing enzymes in a powdered form are more bio-available (easily assimilated) than compressed tablets. This is important because a tablet that breaks down too slowly will fail to provide the specific nutrient benefit at the right intestinal sites, thereby decreasing absorption and potentially causing gastrointestinal upset. There are many advantages of using supplemental microbial enzymes as opposed to animal derived enzymes. Fermented enzymes have been used in foods for centuries. Microbial enzymes have been specially selected on the basis of each enzyme's unique characteristics. Fermented enzymes exhibit broad ranges of pH, temperature and substrate specificities. Supplemental microbial enzymes are chosen on their ability to work within the gastrointestinal system. Specially selected for compatibility with the body's temperature, microbial enzymes also exhibit activity across a broad pH range. Unlike supplemental enzymes of animal origin, microbial enzymes work at the pH found in the upper stomach. Food sits in the upper portion of the stomach for as long as an hour before gastric secretions begin action. Several studies conducted at major universities have shown that the enzymes in saliva continue their digestive activity in the upper stomach and can digest up to 30% of the ingested protein, 60% of ingested starch and 10% of ingested fat during the first 30 to 60 minutes after consumption. Although salivary enzymes accomplish a significant amount of digestion, their activity is limited to a pH level above 5.0. Supplemental microbial enzymes are active in the pH range of 3.0 to 9.0 and can facilitate the utilization of a much larger amount of protein, carbohydrates and fat before hydrochloride is secreted in sufficient amounts to neutralize their activity. Supplemental enzymes of animal origin are destroyed by the low pH within the stomach unless they are enterically coated. Yet, this coating can prevent the dissolution of the enzymes and prevent any digestive benefit. Studies have shown that non-enteric coated products can be more effective than coated products. Furthermore, animal-based enzymes function only at the narrow pH ranges found at specific anatomical sites. Pepsin is only active in the highly acidic environment of the active stomach. Pancreatin, trypsin and chymotrypsin are only active in the alkalinity of the duodenum. Supplemental microbial enzymes exhibit activity throughout the entire digestive process. Therefore, microbial enzymes can play a significant role in improving food nutrient utilization. Another advantage of microbial enzymes is the variety of enzymes available for supplementation. While pancreatin offers only protease, lipase and amylase activities, microbial enzymes offer protease, peptidase, lipase, amylase, glucoamylase, invertase, malt diastase, lactase, alpha-galactosidase, cellulase, hemicellulase, pectinase and phytase activities. Pancreatin is a pre-defined blend and the only alternatives are proportional increases in total activity that may not be necessary. Customization and flexibility to match the appropriate enzymes to the diet is another strength of supplemental microbial enzymes. Yet, another advantage of microbial enzymes is that they are animal-friendly. These enzymes are vegetarian and cruelty-free.